To detect an effect of landscape context on a species’ response, the landscape variables need to be measured within the appropriate distance from the species’ response, i.e. at the scale of effect. However, it is not clear what factors determine the scale of effect. Our objective was to test the prediction that the scale of effect should be smallest when the species’ response is fecundity, larger for abundance, and larger still for occurrence. 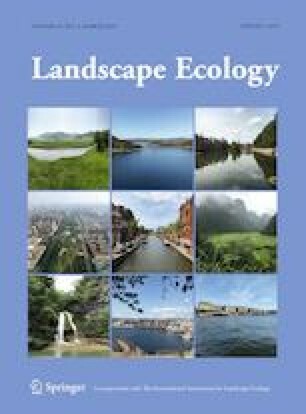 We compared the scale of effect of two landscape variables (road density, forest proportion) on the three responses (fecundity, abundance, occurrence) for the wood frog (Lithobates sylvaticus) in eastern Ontario, Canada. We used egg mass surveys of 34 ponds to estimate fecundity (mean eggs/mass), abundance (number of masses), and occurrence (presence/absence of egg masses). We then empirically estimated the scale of effect of each landscape variable on each response. The scale of effect differed among responses, from 0.2 to 3.0 km radii; however, it did not vary in the predicted order. Furthermore, the order was not consistent between the two landscape variables. Our results show that the scale of effect of a landscape variable on a given species can differ for different response variables. However, they also suggest that these differences in the scale of effect are not predictable. Thus, the most reliable way to ensure a landscape context study is conducted at the correct spatial extent is to estimate the scale of effect empirically, rather than ‘guesstimating’ the extent a priori. The online version of this article ( https://doi.org/10.1007/s10980-019-00808-9) contains supplementary material, which is available to authorized users. We thank the private landowners who let us sample their ponds. Erik Pervin and Caitlin Brunton were indispensable field assistants. We thank Joseph Bennett and Jeremy Kerr for helpful comments and suggestions. We also thank the associate editor and two anonymous reviewers for their comments on an earlier version of this paper. This work was supported by a Natural Sciences and Engineering Research Council of Canada Grant to Lenore Fahrig. All work complied with the Canadian Council on Animal Care requirements for the use of eggs in research (Category of Invasiveness A). The data sets generated during the current study are available in the Mendeley Data repository, https://doi.org/10.17632/ccw64rpj22.1.